January 31, 2019 – In 2019 Palau issues a “Golden Egg”, designed by CIT Coin Invest AG. Whether it is Game of Thrones, Harry Potter, or Inheritance Cycle, dragon eggs have repeatedly been at the center of numerous fantasy novels’ plots. Because dragons fascinate people all over the world: despite their massive size and enormous power, many of them form a bond with humans. Golden Dragon Egg boasts with advanced micro minting details. 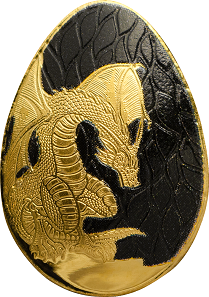 This Golden Dragon Egg is the fourth issue of the “Golden Eggs” series, which includes Golden Egg No 1 (2015), Egg No 2 (2016), and The Swan Egg (2017). The fact that collectors can observe how the technology applied to produce these small gold coins is constantly being refined, has almost become a trademark of CIT Coin Invest AG. 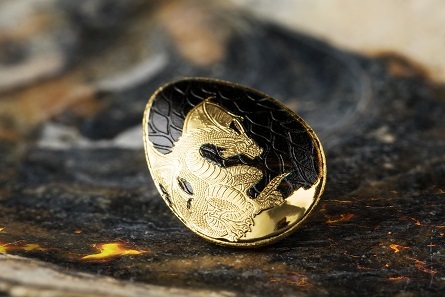 The egg-shaped coin, which is only 14 mm in size and is produced by Micro-Minting, features a dragon with all its details. Even the tiniest scales are clearly visible through a magnifying glass. The partial coloring on the reverse, which was inspired by lava and is reminiscent of dragon skin, is a combination of a carefully struck relief and precise coloring. Palau / 1 Dollar / .9999 Gold / 0.5 g / 9.7 x 13.92 mm / Mintage: 5,000. 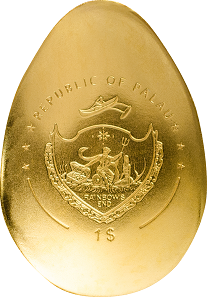 The egg-shaped blank depicts the coat of arms of Palau in micro minting, above REPUBLIC OF PALAU, below 1 $. The coin was minted by B. H. Mayer’s Kunstprägeanstalt, Munich. For further information on this coin go to the Coin Invest website. Learn more dragons in mythology in this episode of “Exploring Mythology”.